Resolution of construction claims and disputes can be an expensive and time-consuming exercise and always require knowledge of local laws and regulations and how they impact your construction project. If you are having problems with another party during the construction process that cannot be resolved or if you are unsure of legal issues that may impact your project then you will want to retain the services of a law firm in your area. There can be a large number of facets of your construction project that may necessitate your retaining legal counsel for assistance. These include but are not limited to: delay and disruption claims of the building, contract and specification scope disputes and disputes in construction cost accountings, disputes or grievances relating to time and materials costs, types of raw materials utilized, addressing or not addressing local regulatory issues, permitting process not handled properly, subsurface and other changed conditions, defective and non-conforming work as per set standards, usage of third party contractors that are not properly licensed, non compliance with building codes, variances from previously agreed upon standards, etc. A professional law firm will first understands the nature of the claim and advise the client on whether or not it should be taken up, potential upside or downside by pursuing a claim, impact of an existing project and or a preliminary analysis of the situation. Once the law firm has decided that legal action should be taken up the firm will provide advice and strategies on how to go about the process – the firm will take into account the various details and documents that are required to fight the case and will communicate the need for these to the client. The law firm will provide comprehensive legal representation services that include filing and contesting the legal action and advising the client on all facets of the claim. A law firm that is knowledgeable about legal and/or regulatory issues that impact your real estate construction project can prove invaluable in contesting building claims and disputes. 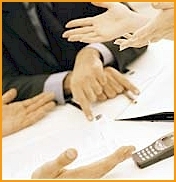 They can advise you as to the merits of moving forward with a contract dispute, what the possible outcomes could be as a result of taking such legal action and/or how to negotiate with the other party or parties to save you considerable time and resources prior to, during or after legal proceedings have been completed.